Not only do fruit and vegetables taste better if eaten in season but they can incur amazing health benefits too! So what should we be eating in June to super charge our health? The high levels of Vitamin C present in mangetout help create and maintain collagen, a protein important to hair and skin. It also contains Vitamin A which increase sebum production helping to keep moisture in the hair. One cup of mangetout provides half our daily requirement of vitamin K important to the integrity of our bone matrix. Vitamin K also improves the absorption of calcium helping to prevent bone loss and osteoporosis. The antioxidants in gooseberries help protect cells from the damage that leads to cancer. Research also indicates that gooseberries may slow the growth of cancerous tumors. Studies show that gooseberries are beneficial for people with diabetes and diabetic complications. A study published in 2012 stated that gooseberries had positive effects on fasting glucose levels. It also lowered hemoglobin A1c (HB-A1c). 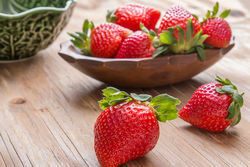 Strawberries contain the antioxidants quercetin, kaempferol, and anthocyanins which all have been shown to reduce the formation of harmful blood clots associated with strokes. High potassium intakes have also been linked with a reduced risk of stroke. Strawberries are a good source of folate which can reduce the levels of homocysteine from forming in the body. Homocysteine interferes with the production of the feel-good hormones serotonin, dopamine, and norepinephrine, which regulate not only mood, but sleep and appetite as well.